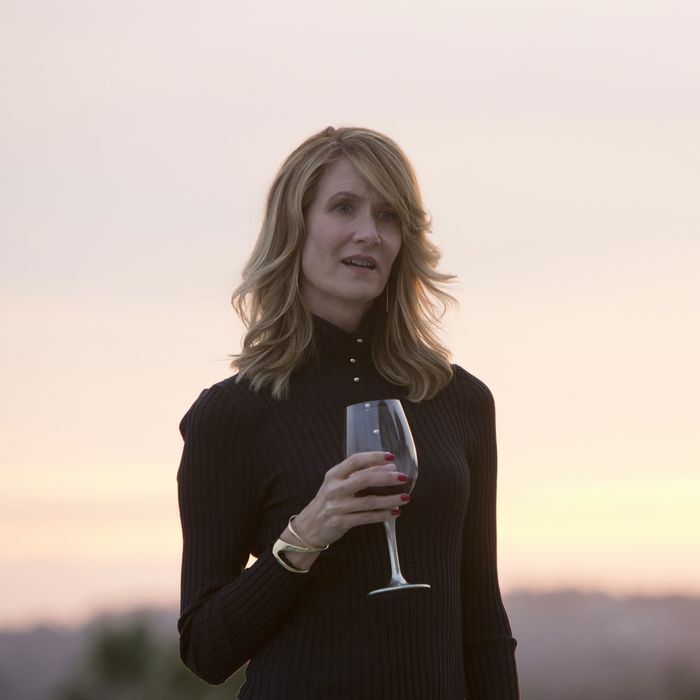 Laura Dern on Big Little Lies. Moms. Intrigue. Murder. Wine. More moms. More wine. That’s pretty much all you need to know about HBO’s latest A-list mini-series Big Little Lies, which stars Reese Witherspoon, Nicole Kidman, and Shailene Woodley as a group of Monterey super-moms whose seemingly perfect lives unravel to the point of murder at an alarming speed. (It’s adapted from Liane Moriarty’s popular 2014 novel of the same name.) Because it would only be right to watch this delicious drama with a bottle or two of your own — personally, we recommend a flinty California white — we went ahead and put together an unofficial BLL drinking game that’s bound to get you white-mom wasted before the opening credits even finish. For as long as the screen is filled with the sight of waves crashing against the rocks and sand. Sigh. Monterey’s beautiful, isn’t it? Drink! Someone’s being interrogated at the police station! Sip and contemplate who might be behind this terrible murder. Wait, these first-graders listen to David Bowie, Alabama Shakes, and Leon Bridges? Take a sip when the music begins. Drama is a-brewin’ at the elementary school’s drop-off or pick-up. Take another sip. You find yourself sighing dreamily at yet another gorgeous Monterey home. Finish your drink. Shailene Woodley goes for an angry run on the beach. Drink. Rage against society. Drink again. If you see a gun. Drink. If it goes off, finish your drink. That’s Chekhov! Every time Reese Witherspoon’s young daughter calls her “woman.” Giggle and drink. Every time Laura Dern talks about how rich she is. We get it, you own companies, Renata! Drink. Whenever Reese Witherspoon says the words “Avenue Q.” Is this musical appropriate? Finish your drink. Is Zoë Kravitz implying that Reese Witherspoon should be nicer to her children? How dare she! Keep drinking until she stops. Nicole Kidman looks off into the middle distance with an air of distinct melancholy. Take a sip, but make it small. This happens a lot. A mom gazes into the ocean from her patio. Take another small sip. This, too, happens a lot. You get distracted by Adam Scott’s voluminous beard and forget what he’s saying. Don’t you want to touch it? Drink! The ladies gather for a coffee date at that gorgeous Pacific Ocean–adjacent cafe. Finish your drink and wish you had a cute waiter on hand to give you a refill. Someone makes an ominous reference to the night of the fundraiser. Drink in honor of a plot point that, in perfect mom-thriller style, combines both charitable giving and murder.